Love this picture of Harper Beckham with her mom Victoria shopping while on vacation in Sydney, Australia on October 27, 2018. 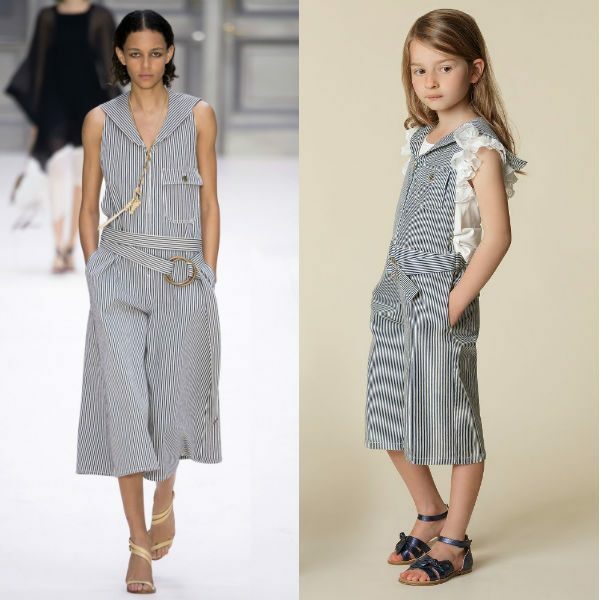 Harper looked super stylish wearing this CHLOÉ girl Mini-Me Blue & White Overalls from the Spring Summer 2018 collection. These short, blue and white striped Mini-me Chloé overalls with a sailor-style collar are inspired by the adult collection. Designed in Paris by the famous French fashion, this adorable Mommy & Me Look was featured on the Runway at Paris Fashion Week for Spring Summer 2017. Harper completed her street style look with a white t-shirt and trainers. The adorable Chloe Girl Blue & White Overalls is now sold old but you can shop similar Chloe Girl overalls in the Fall-Winter 2018 collection.